All transactions are safe and secure with a reliable history in online purchasing behind each of our associates. 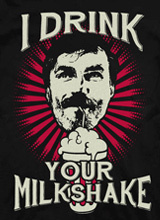 Buy the Daniel Plainview I Drink Your Milkshake t-shirt to own There Will Be Blood clothing and merchandise. The front of this bestselling I Drink Your Milkshake t-shirt features Daniel Plainview drinking a milkshake. If you subscribe to Entertainment Weekly, then you read about the milkshake craze in the February 15, 2008 issue. Gregory Kirschling's piece titled "Shake, Shake, Shake" explored the popularity of There Will Be Blood's milkshake quote. In addition to the tees, Kirschling also mentioned a YouTube video and a website devoted to the catchphrase (and Paul Thomas Anderson's movies). This Daniel Plainview shirt is one of the most popular milkshake tees. In addition to the Daniel Plainview I Drink Your Milkshake tee above, browse the There Will Be Blood Clothing Gallery for more apparel like men's and women's clothes, kids shirts or hoodies.